Features:100% brand new and high quality.Key locked removable side panels which can provide easy access.It has a ceiling fan and venting slots to keep your equipment cool.Super durable for long time using.Air vents on both front and side door design.It is perfect to organize your networking equipment.Easy to use and to operate.Specifications: Main Color:blackItem Size:54.5*39.5*44.5cmPackage Size:55*40*45cmMaterial: Steel, Surface Is SPCC Cold-Rolled Steel With 5mm Tempered GlassThickness Of Pillar:2mm Thickness Of Armored Glass:5mmPackage included: 1 x Network Cabinet2 x Keys1 x Set Of ScrewsNote:Due to the different monitor and light effect, the actual color of the item might be slightly different from the color. Reference: G0506069 JG REDNEW. Location Reference: 211A. This is aGrade 3item. 600w x 670d x 740h (APPROX. 24" x 27" x 29"). The cabinet is on wheels and in FAIR condition - HENCE LOW START PRICE. THE ITEM WILL BE CANCELLED END OF MONTH, SO FOR NOW - GRAB A BARGAIN. Side panels are removable in service (push-down release). THE ITEM WILL BE CANCELLED ON THE 25th OF MARCH, SO GRAB A BARGIN. cabinets include. shelf supports, PC and Monitor shelves, sliding keyboard shelf, 2 removable side panels. I have 5 x 1U brush plates for sale. Features:100% brand new and high quality.Key locked removable side panels which can provide easy access.It has a ceiling fan and venting slots to keep your equipment cool.Super durable for long time using.Air vents on both front and side door design.It is perfect to organize your networking equipment.Easy to use and to operate.Specifications:Main Color:blackItem Size:54.5*39.5*44.5cmPackage Size:55*40*45cmMaterial: Steel, Surface Is SPCC Cold-Rolled Steel With 5mm Tempered GlassThickness Of Pillar:2mmThickness Of Armored Glass:5mmPackage included:1 x Network Cabinet2 x Keys1 x Set Of ScrewsNote:Due to the different monitor and light effect, the actual color of the item might be slightly different from the color showed on the pictures. Thank you! . For use with CAT6 solid 4 pair UTP 23AWG cable. 1U height and standard 19" for racks & cabinets. Insulation Resistance: >1000M-ohm. Add to Favourite. Pick up is not available. 1x Screws Accessory Kit. This is a 19" rack cabinet for installing on a desk / table top (freestanding). Painted in dark grey wrinkle finish paint. 32 cms deep. It is in generally sound condition with no rust, major scratches or dings. Quick and easy to assemble. Adjustable front mounting rails. Brand new. Wall-mount panel comes with 12 ports. Space saving, high-density 1U (12 Port). Black electrostatic powder-coated steel. Provide you as many connections as possible. A label in front of each port,so you can identify each of them easily. The back of the device has color coding for you to classify the suitable wiring that can be plugged. Cat6 Wall-Mount Vertical 110 Patch Panel is Cat6 certified so you can maximize the speed of Cat6 cabling in your network. Material Cold-rolled Steel , PC Plastic Color Black Size 25.5 x 5.7cm Port Type Cat 6 Ethernet (RJ-45) Number of Ports 12 Brand Unbranded/Generic MPN WO43499127414 EAN 43499127414. 1U 1RS BLACK 19" BLANKING RACK PANEL. Purpose/capacity rack panel. 482 mm (19") Rack Panels. Rack spaces, RS 3. Colour black. Established in the 1940s, Henry's is a powerhouse in Electronics. Henry's is here to provide a wealth of experience along with every sale. 9U 19"Removable Network Cabinet Data Comms Wall Rack, Patch Panel,Switch,PDU LAN Features: supporting board The height of supporting board can be randomly adjusted radiator Support to dissipate heat Brand Unbranded MPN Does not apply EAN Does not apply Material Steel, Surface Is SPCC Cold-Rolled Steel With 5mm Tempered Glass Thickness Of Pillar 2mm Main Color black Thickness Of Armored Glass 5mm. Gigabit ready rack mount 24-port panel. Ideal for Ethernet, Fast Ethernet and Copper Gigabit Ethernet (1000Base-T) network applications. Insulation Resistance: >1000M-ohm. Use with TRENDnet TC-PDT Punch Down Tool. Brand new. Wall-mount panel comes with 12 ports. Space saving, high-density 1U (12 Port). Black electrostatic powder-coated steel. Provide you as many connections as possible. A label in front of each port,so you can identify each of them easily. The back of the device has color coding for you to classify the suitable wiring that can be plugged. Cat6 Wall-Mount Vertical 110 Patch Panel is Cat6 certified so you can maximize the speed of Cat6 cabling in your network. Material Cold-rolled Steel , PC Plastic Color Black Size 25.5 x 5.7cm Port Type Cat 6 Ethernet (RJ-45) Number of Ports 12 Brand Unbranded/Generic MPN DE608415747383 EAN Does not apply. Numbers on Board RoHS E188100, ec-242 15., IPTB B1110. 24 CAT6 ports with RJ45 sockets. Patch panel use mainly use to manage the front-end information point in the central office modular device. Rack Unit Height 1 U. Colour: Black. Insulation Resistance: >1000M-ohm. Single server cabinet. Smoked glass front with 2 keys. Collection only from SO30. 12u server cabinet used. Condition is Used. Collection in person only. Been in storage and now needs to go. Most definitely used and is dirtier than the pics came out. Some parts have rust marks on them. No keys 2 extra shelfs Dimensions 74/60/90cm Inc wheels. 9U 19"Removable Network Cabinet Data Comms Wall Rack, Patch Panel,Switch,PDU LAN Features: supporting board The height of supporting board can be randomly adjusted radiator Support to dissipate heat Brand Unbranded MPN SGHKFRN0KL937 EAN Does not apply Material Steel, Surface Is SPCC Cold-Rolled Steel With 5mm Tempered Glass Thickness Of Pillar 2mm Main Color black Thickness Of Armored Glass 5mm. Purpose/capacity rack panel. 482 mm (19") Rack Panels. Rack spaces, RS 3. Colour black. Established in the 1940s, Henry's is a powerhouse in Electronics. Henry's is here to provide a wealth of experience along with every sale. 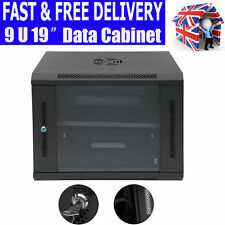 2u 19" rackmount server chassis with PSU and lockable caddies. Never used, but not in new condition due to significant scratches on case top, as shown. Unit is 490mm deep, measured from the back of the mounting lugs. Collection in person also available. Ethernet CAT 6 24 Port Patch Panel. ※Heavy duty 24 port patch panel supports Cat6 Ethernet and is backwards compatible with Cat5e Ethernet. Network Rack Mount Hub Switch UK. ※Future-proof your network connection for 10-Gigabit Ethernet with this durable RJ45 patch panel. Server cabinets 6U. Wall mounted cabinet. Cabinet accessories. In the last few years prices of server racks have been high, but Rack Supplier has succeeded in reducing their prices while maintaining very high quality. Wall-mount electronics cabinet / Server Rack enclosure / Wall Cabinet / Flush mount / 12U rack / Horizontal Wall Mount / 12u server rack / 19"" server rack. Lockable acrylic door with a large viewing area. • 19" PULL-OUT SHELF 1U. • Fixed on four mounting profiles - mounting height 1U. • GREY- powder paint coated shelf. 12U Server Network Cabinet Data Comms Wall Rack, data cab. Collection in person only. 12U 19" 550MM Deep Black Wall Mounted Data Cabinet Patch Panel Comms Network Features: 100% brand new and high quality. Top open brackets design which is designed for cable and wire access. Key locked removable side panels which can provide easy access. It has a ceiling fan and venting slots to keep your equipment cool. Air vents on both front and side door design. It is perfect to organize your networking equipment. 4U rack mounted case with lockable front door. 1 free 3.5" external bay. Case fans (front 120mm, rear 80mm). 3 free 5.25" external bays. 42U 19" Racking Lockable Comms cabinet IT network server on castors. 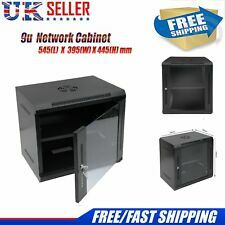 42U 19" Racking Lockable Comms cabinet IT network server on castors.. Condition is Used. Collection in person only. Colour: RAL 9005 black. Panel Width: 19" (483mm). Panel height: 1U (44.1mm). Panel depth: 132mm. Outlet Style: Unkeyed RJ-45. Punch Down Blocks: LSA style IDC. Black and cream chair: 42 in (high), 25 in (wide), 22 in (deep). Condition is Used. This chair has barely been used and is in excellent condition.